Seven months into 2018 condo sales prices are up a staggering 11% this year. Sales are outpacing the prior year with volumes up 26% compared to the same period last year. This is all despite an inventory shortage for many individual floor plans. Much of the supply we are seeing is coming from the many preconstruction owners who have yet to see a complete recovery to their original purchase prices. Financing is loosening slightly, but still holding to strict lending requirements. Speculators and flippers are nowhere to be seen. These factors are contributing to the healthy condo market we are seeing in Panama City Beach. The average price per square foot for condos built after 2001 increased 11.2%. We saw an indication of this last year when 1/3 of the condominiums built after 2001 saw price increases of 4.7%-9.8%. 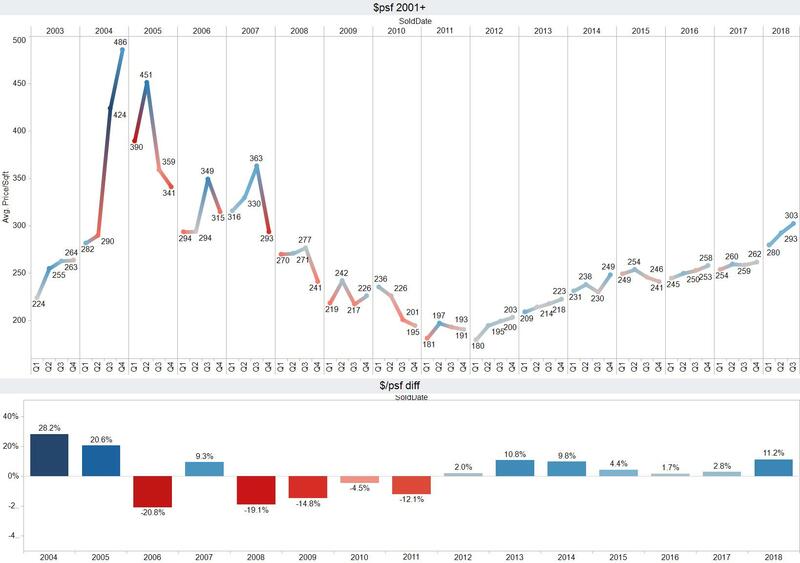 Panama City Beach condo sales volumes were up an 26.6% to date, compared to the same time last year. This was on top of last years 40% annual increase. This may be attributed to price points reaching levels where many preconstruction owners are comfortable selling. 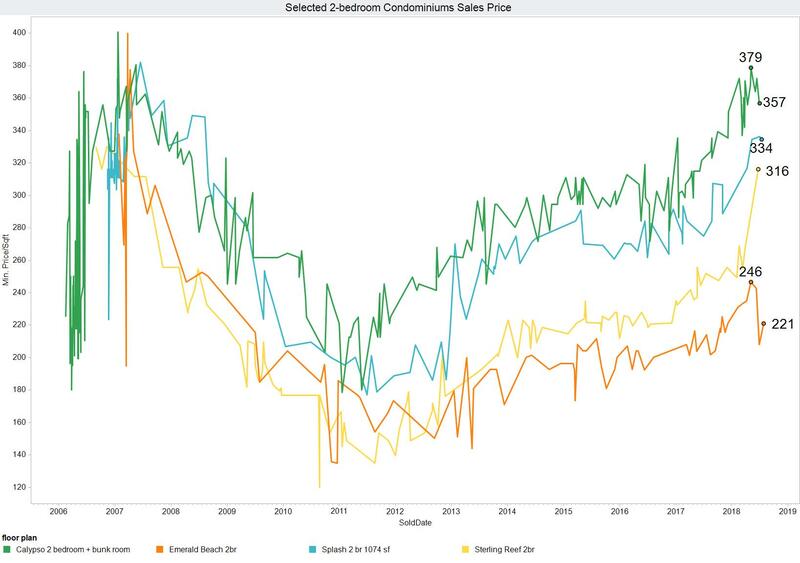 With many condominiums are still well below original preconstruction sales prices, this trend is likely to continue for some time. 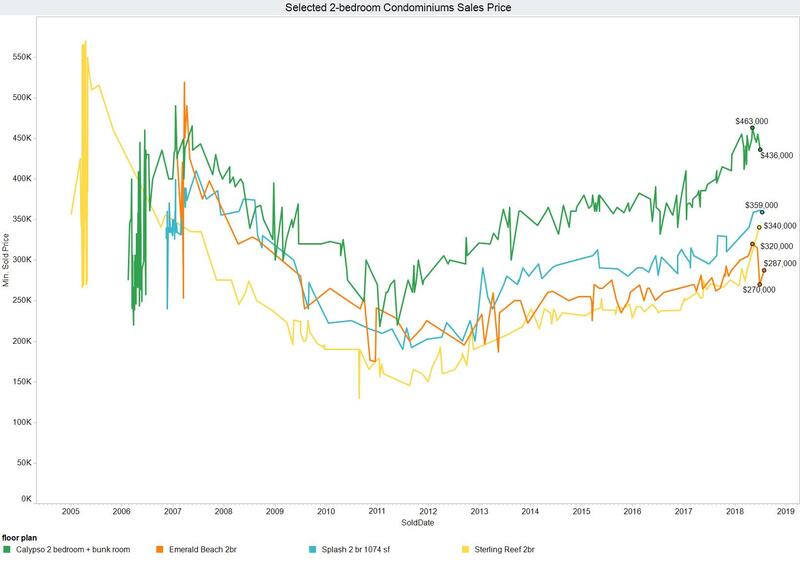 This graph provides a snapshot of individual per square foot prices different two-bedroom condominiums are selling at. Calypso is leading the market, commanding up to 379 $psf (Dollars Per Square Foot). Splash Condominium has a recent sale at 334 $psf, Sterling Reef is misleading at 316 $psf. That sale was a first-floor unit. The first-floor units have a balcony almost equal to the size of the entire condo. Emerald Beach has seen sales as high as 246 $psf. This helps to break down the average two-bedroom per square foot price of 303 $psf. Last updated on 12 November 2018 .